Not really Great War related but I was very saddened to hear of the death of Brian Hanrahan at the age of 61 from cancer. I always thought him a quality journalist and well remember his reporting of the Falklands conflict. 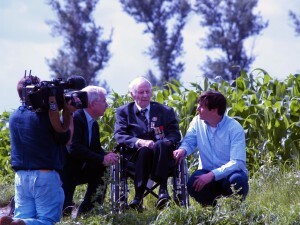 I met him in July 2007 when he led a BBC team that followed Harry Patch on one of his pilgrimages back to Ypres. 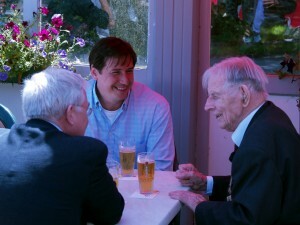 Brian seemed a really nice guy, genuinely interested in Harry and the visit. You can tell with many journalists that it is ‘just a story’. 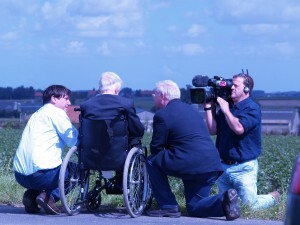 On that 2007 trip it was clear that Brian certainly realised it was more than a story and acknowledged how lucky he was to have such unfettered access to Harry on his time in and around the Ypres Salient. He was a real gentleman, was never pushy with his requests and was quite happy to just follow us on our usual pilgrimage sites. The footage from his team’s visit is available on YouTube here but, sadly, this is the BBC West version so it doesn’t have Brian’s commentary. 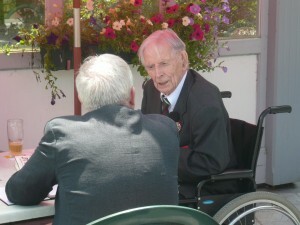 Some photos of him interviewing Harry on the Passchendaele battlefield and then relaxing at John Vandewalle’s wonderful De Dreve café at Polygon Wood. 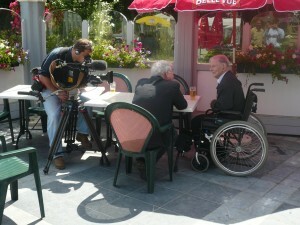 It was during this interview, literally over a beer, that I saw Harry at his most relaxed. This was, in no small part, down to the skill of the interviewer. Great memories for us who were there and very sad to think that both men have now died.